At Dong's Inbicon plant, ethanol is produced from bio-feedstocks such as straw. Towering 88 m above frigid waters, scarcely 5 m from the seawall south of the industrial area of Avedore Holme, near Copenhagen, stand two prototypes of the largest and latest generation of offshore wind turbines. With blades stretching 59 m, nearly 10% longer than those of some of the biggest turbines now running, these two white giants have the capacity to generate 7.2 MW of electricity  equal to the annual power consumption of about 4,900 Danish homes. Constructed and operated by Dong Energy A/S, Denmark's biggest utility, the turbines are being tested for use in an offshore wind farm that the company plans to build in the Irish Sea. Back on terra firma in Kalundborg, northwest of Copenhagen, stands Dong's gleaming Inbicon demonstration plant. Built for the large-scale production and commercialization of second-generation bioethanol, Inbicon is Dong's bid to prove that cleaner, renewable energy made from agricultural waste is viable for investors and consumers. 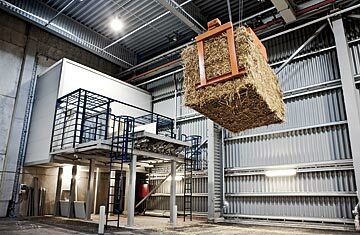 Among the spate of fossil-fuel alternatives the plant produces: straw-based ethanol, biopellets (a coal substitute) and feed booster for biogas production made from C5 molasses. More than just demonstration plants, these sites represent a dramatic shift in business strategy at Dong, which was founded in 1972 as a North Sea oil and gas concern and later expanded to include Denmark's electric utilities. Under CEO Anders Eldrup, Dong has embarked on an ambitious project that it calls the 85/15 plan: to slash 85% of its carbon emissions within one generation by drastically moving away from fossil-fuel production and investing more in renewable energy. Oh, and to be profitable. Says Eldrup: "We are not doing this from a feel-good perspective. We see it as sensible business." So do a number of other European companies  many involved in some of the dirtiest industries  that are taking radical steps to develop and deploy green energy solutions. It hasn't been completely voluntary. European governments and strong public sentiment have pressed industry to improve environmental standards through a combination of regulations, subsidies, incentives and publicly financed research. Rather than resist, some companies used the enviro-prodding to become more innovative and energy efficient, and they now find themselves with a global competitive advantage in the green tech so coveted by the U.S. There's no better example than Aurubis AG, the largest copper producer and processor in Europe, which as far back as the 1980s was facing some stringent environmental-protection laws. The company is headquartered in Hamburg, the industrial port city once ruefully nicknamed "the black hole of Europe," which had put into effect some of the most severe climate-protection targets on the continent. Aurubis, founded in 1866, had long contributed to that blackness and figured it had few options beyond outsourcing or shutting down  both of which were roundly rejected. According to Bernd Drouven, Aurubis' CEO, the company took a different tack. It decided to go radical green and invested in and developed state-of-the-art energy-efficient plants and environmental technologies to drastically curb emissions. Says Drouven: "The pressure from regulations and society forced us to be creative in finding technological solutions and ideas in order to cope." Today Aurubis considers sustainability a cornerstone of its strategy. Over the past 30 years, Aurubis has invested some $410 million in reducing emissions  a third of its total capital expenditure. Aurubis' investment has led to technological solutions such as building thermal-power plants, using filters to reduce fugitive emissions and eliminating up to 95% of the copper, sulfur, arsenic and lead in the air and metal loads of wastewater at its production sites. Aurubis has seven production sites across Europe that manufacture some 1 million tons of copper cathodes and more than 1.2 million tons of other copper products annually. Incidentally, the European Commission designated Hamburg, "the black hole," as its Green Capital for 2011. Green innovation has made Aurubis a world leader in copper-recycling technology. The company recycles and processes more than 400,000 tons of raw materials in its proprietary facilities, which reduces energy consumption, saves natural resources and prevents the loss of valuable materials. Roughly 40% of Aurubis' copper products come from the processing of copper scrap and other copper-bearing recycling materials. It was the shock of the Middle East oil crisis in 1973 that compelled Denmark, dependent on imports for 90% of its oil supply, to become a pioneer in alternative energy. The government imposed a spate of regulations and taxes that transformed the nation's energy production and consumption, launching an energy industry that generates billions of dollars and provides tens of thousands of jobs. Currently, wind power supplies 20% of the country's electricity. Denmark's energy technologies account for about 11% of its exports.